Human activities such as construction, agricultural, mining and industrial activities can cause triggered or induced seismicity – or tremors in the earth. Human activities such as construction, agricultural, mining and industrial activities can cause triggered or induced seismicity – or tremors in the earth. But such tremors are rarely a cause for concern given the mild nature of most human-caused seismic events. In fact most cannot be felt, being detectable only with sensitive instruments. Tremors generated by oil and gas hydraulic fracturing – or “fracking” – are usually a million times weaker than the felt seismicity threshold, typically measuring minus 2 (below zero) on the Richter scale. This is why over two million wells have been fracture stimulated worldwide since the 1940s without creating earthquake hazards. There have been instances of felt seismicity attributed to oil and gas operations. These were generally associated not with production or fracturing, but with wells that inject water into rock formations deep underground. Such felt seismicity has also been attributed to various industrial activities, as well as water impoundment behind large dams. Of more than 172,000 oil and gas-related injection wells in the United States, only a small percentage have been associated with felt seismicity. In these cases, modification of fluid injection activities mitigated the seismicity. ConocoPhillips and others in the industry are actively working with independent researchers to arrive at science-based conclusions and solutions that minimize the probability of human induced felt seismicity. The Earth’s crust is dynamic – meaning that its slowly migrating tectonic plates grind against each other, gradually building and storing energy. When the stress becomes great enough, the crust shifts along fault lines, releasing energy and causing earthquakes. Each year, approximately 100,000 of the millions of earthquakes that occur worldwide measure magnitude 3 or greater on the Richter scale – the level at which they often can be felt by humans at the surface. 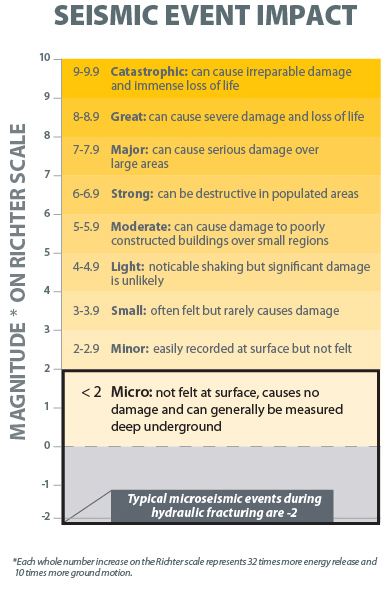 Only a few hundred are powerful enough to cause structural damage (generally magnitude 5 or greater). The Richter scale is logarithmic, with each whole number increase representing 10 times more ground motion and 32 times more energy released.